Currently based out of Atlanta, Georgia, I’m an Army brat who grew up with a love for the strange and unusual. The work of fairy tale illustrator, Trina Schart Hyman, inspired me at a young age to pursue illustration. 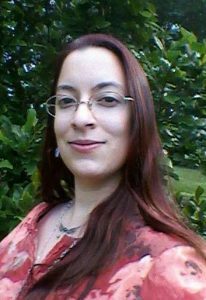 My past clients have included Disney, Impact Books, Jacqueline Carey (author of Kushiel’s Legacy), and self-published authors. You can view my work history and clients on LinkedIn. (Writer & Artist) Angelic Visions: Create Fantasy Art Angels With Watercolor, Ink and Colored Pencil. (Writer & Artist) Amaranthine: Rapunzel Webcomic. (Cover Artist) Genesis by Wade Garret. (Cover Artist) Blacksent by Michael A LaFlamme and Michael D. Poe. More listings over on LinkedIn. 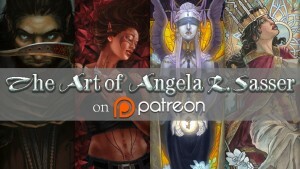 If you enjoy my work, consider sponsoring me on Patreon for exclusive rewards! I am open to both private commissions for art collectors and freelance opportunities. Read more here to find out how to commission me. Need to contact me? E-mail me at angela(at)angelasasser.com and I will return your message ASAP. You can also keep up with my work by signing up to my mailing list.